The Sherwood High School boys basketball team seemed to have plenty of it. The Bowmen were full of energy at the beginning of their game at Tigard. And, at the end of the contest, they seemed maybe have even more. Add in some clutch shooting and some solid defense, and Sherwood squad came up with an impressive road victory. 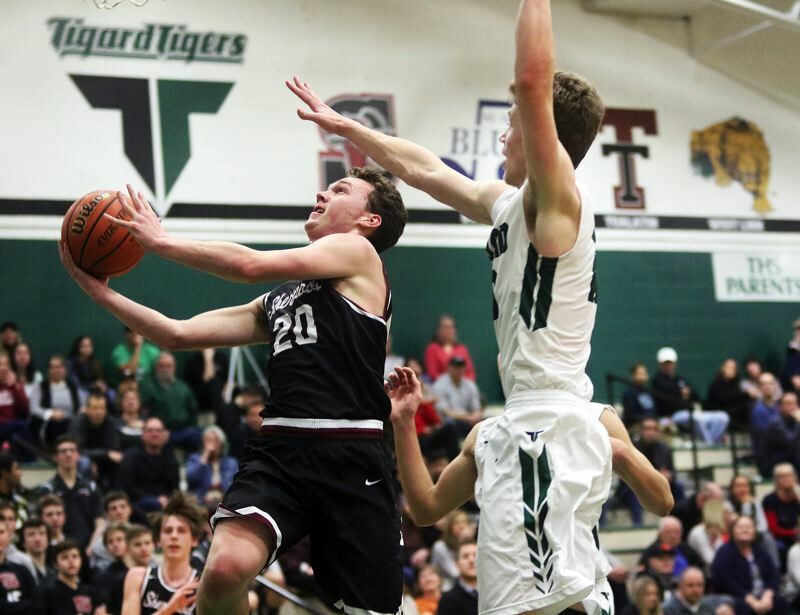 The Bowmen, grabbing the lead from the start, and never letting it go, ran to a 69-55 win over the Tigers in a Three Rivers League game played Friday at Tigard High School. "This was humongous," said Sherwood senior post Jace Sucher, who scored 13 points and pulled down 10 rebounds in the victory. "It was the energy." "It's huge," Sherwood senior guard Owen Grubbe said of the win. "We kind of had a rough one at Canby (a 47-42 loss in overtime on Tuesday), and we needed to come back strong. We had the energy the whole game. We came in ready to spank them, and we did." 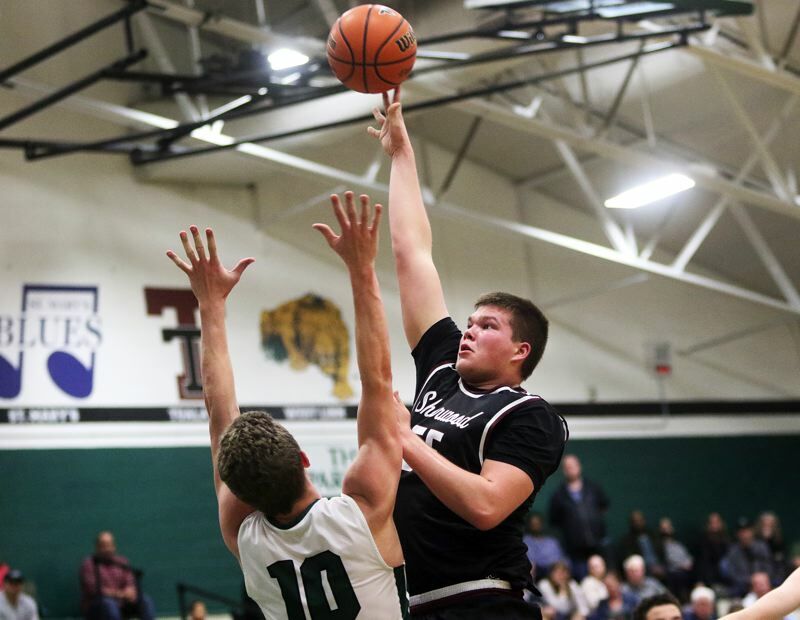 With the victory, it's first ever over Tigard in Three Rivers League play, Sherwood improved to 5-4 in TRL games (12-7 overall), putting the Bowmen in a tie with Tualatin for fourth place in the league standings. "It was our energy," Sucher said again. "We got it from the bench and we got it from our student section." "That's incredibly important," Grubbe said. 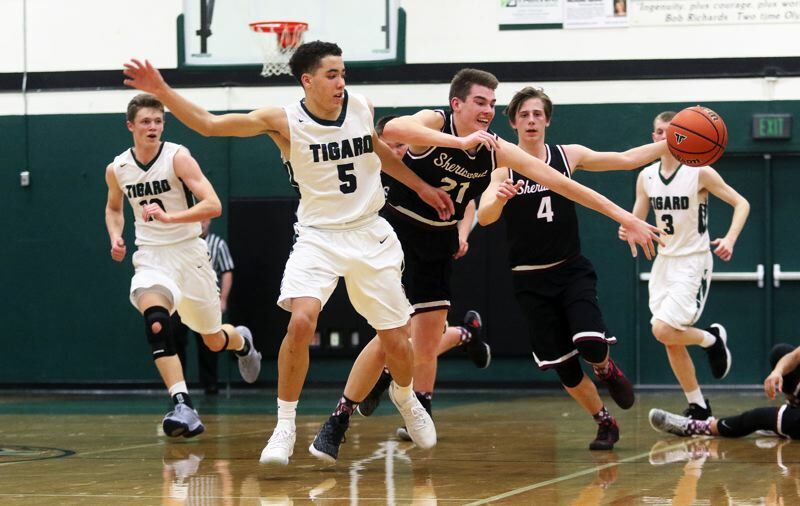 With the setback, Tigard moved to 6-3 win TRL play (10-8 overall), leaving the Tigers in third place in the league standings. "You can't just show up, and that's what we did," Tigard senior post Austin Dufort said. "You can't afford to do that in this league. We learned that the hard way." The Bowmen got off to a blazing start to Friday's game. 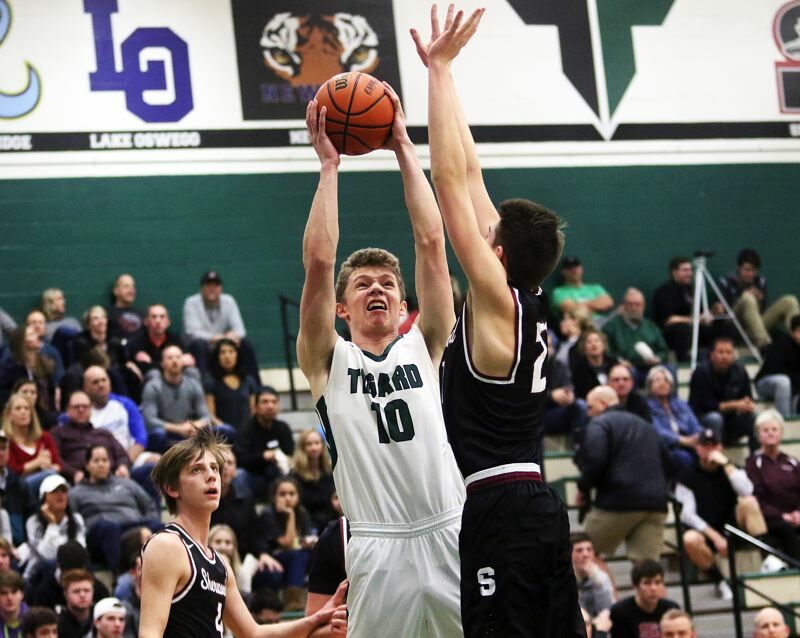 Sherwood senior Nic Koronko sank a pair of free throws, Sucher connected on a 4-foot jumper and Koronko swished a three-pointer from the left corner to give the visitors a 7-0 lead with 4 minutes and 13 seconds left to play in the first quarter. With sophomore guard Jamison Guerra scoring seven points in the final 2:54 of the opening quarter, Sherwood would go on to take a 16-5 advantage at the end of the period. 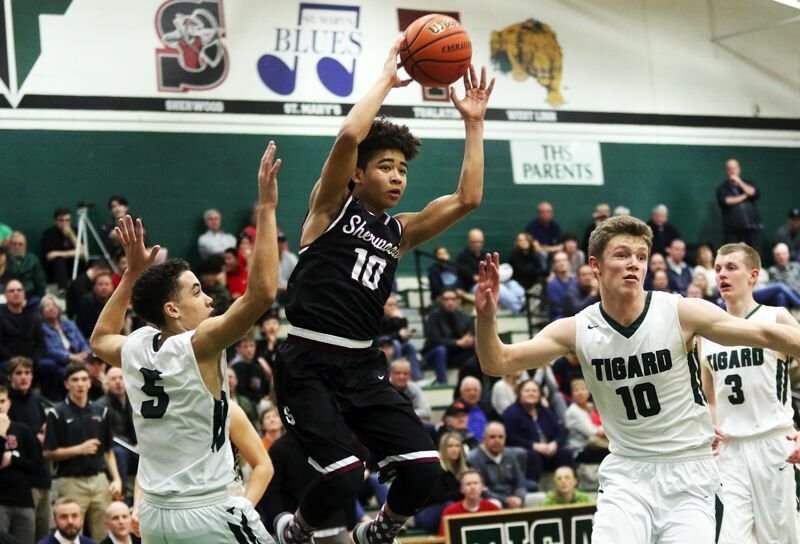 The Bowmen kept rolling to open the second quarter, with Grubbe scoring on a driving bank shot to push the margin to 18-5 just 14 seconds into the period. But that's when the Tigers started battling back. 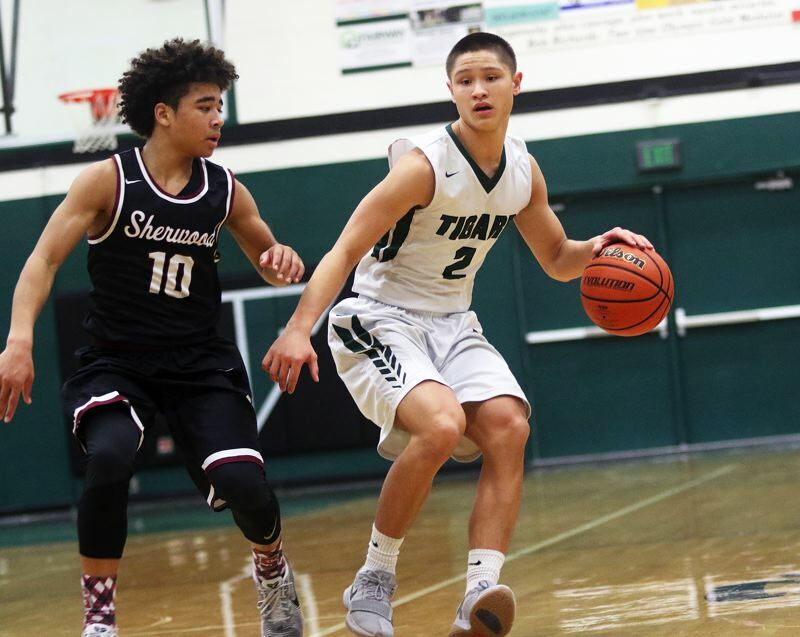 Behind the play of Dufort and freshman wing Drew Carter, who scored four points apiece, Tigard rallied to cut the lead to six, at 22-16, with 3:09 left before halftime. The Tigers were still down by six, at 24-18, after junior Jazz Ross scored on a put-back shot with 2:02 remaining in the second quarter. But Sherwood answered back, getting a three-pointer by junior Braden Thorn, off an assist by Guerra, and a basket on a drive by senior Tyler Thiebes, giving the Bowmen a 29-20 lead at halftime. Sucher opened the third quarter with a three-point play, and a little later, Grubbe scored on a steal and drive, pushing the Bowmen lead to 36-24 with 5:04 left in the period. "I saw it coming," Grubbe said of his scoring play. Sherwood opened the lead to 15, at 40-25, when Guerra sank a driving 10-foot jumper with 3:52 remaining in the quarter. But, again, the Tigers battled back. 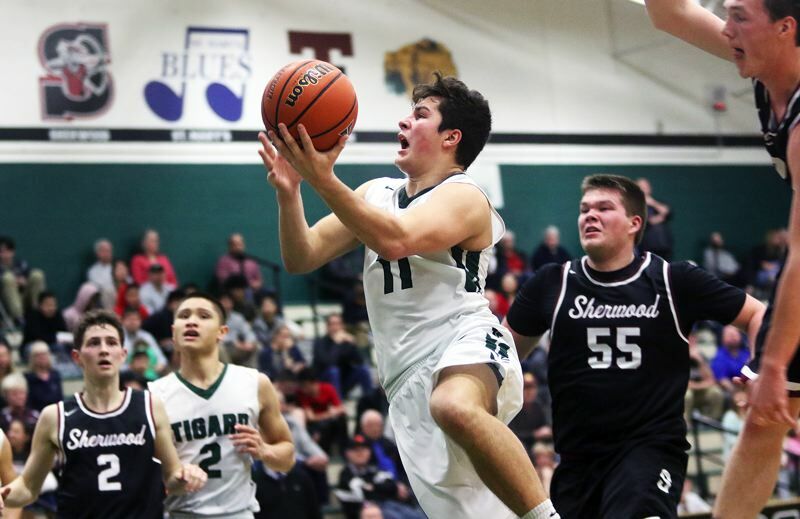 Tigard, with Dufort and junior Stevie Schlabach each scoring a pair of baskets, and with Ross scoring on a short-range jumper off a pass from junior Luke Ness, trimmed the margin to 44-35 going into the fourth quarter. The Tigers, and Schlabach, kept trying to fight back in the final stanza. 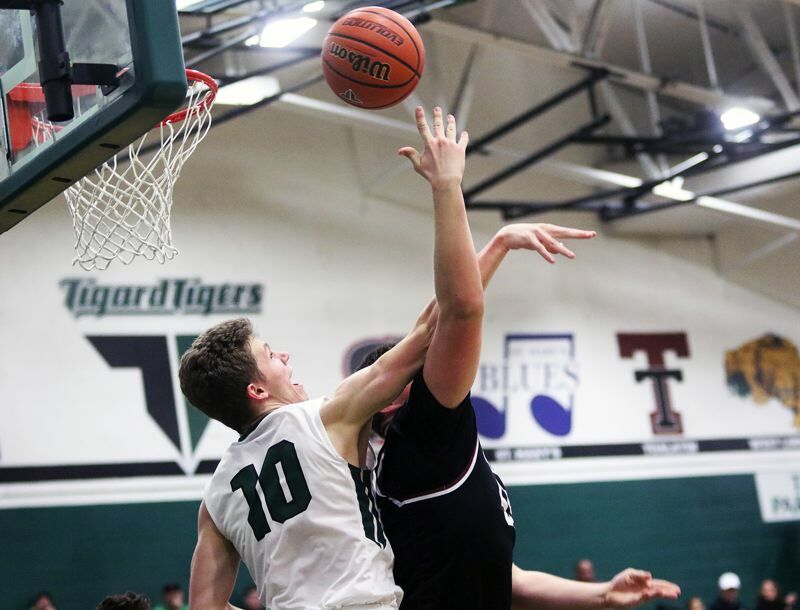 The 6-foot-3 win scored 11 points in the first 3:40 of the quarter, helping Tigard cut the lead to six, at 52-46. But the Tigers wouldn't be able to get any closer. Sherwood, behind three-pointers by Thorn and Kononko, another steal and layup by Grubbe, and free throws down the stretch, was able to pull away for the 69-55 win. "After a tough one on Tuesday, the theme for this game was resiliency," Sherwood coach Rahim Tufts said. "The guys practiced hard and pushed each other. You could see it in their eyes, they were ready. On offense, we played a clean game." Guerra and Koronko led the Bowmen with 17 points apiece. Guerra also had four assists, while Koronko shot at a 4-for-5 clip from three-point range. Sucher and Grubbe each scored 13 points, and Thorn had seven. Sherwood, as a team, made 20 of 40 shots from the field, with six three-pointers, and 23 of 32 free-throw attempts. "That was a blast," Sucher said. "It was one of the most fun games so far." Schlabach led all scorers in the contest with 23 points. He also had five rebounds and three assists. Dufort had 12 points and nine rebounds. Carter added 10 points for the Tigers, and Ross scored five. 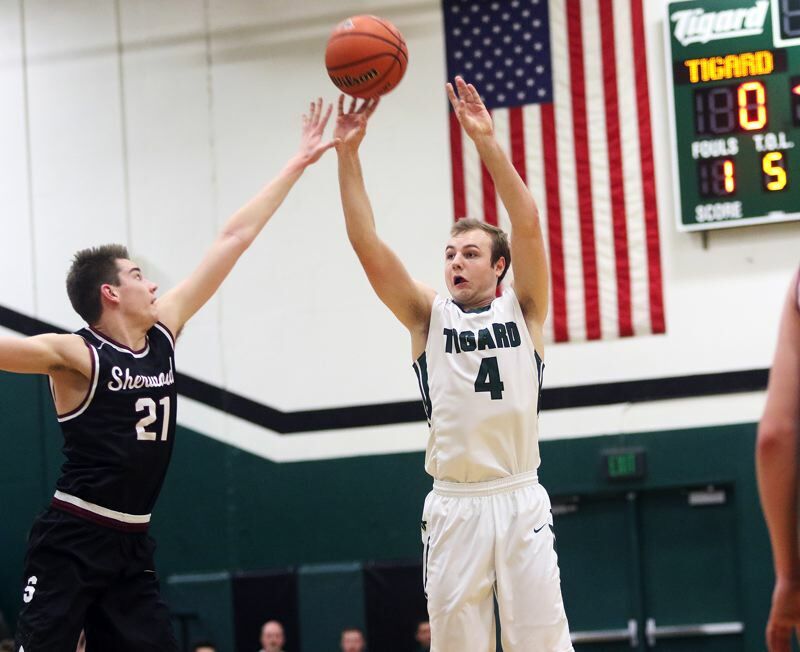 Tigard, as a team, made 20 of 49 shots from the field and 15 of 19 free-throw attempts. "We tried to come back, but you have to credit them. They came to play," Dufort said. "They made some big shots when they needed to." Both teams will be back in action on Sherwood will play at Lakeridge at 6 p.m. and Tigard will travel to Newberg for a 7 p.m. contest.